So: the deal, pact, commitment I made with my self if I didn’t return home with the job I wouldn’t return period, end of story. I’d jump from one of Cornell’s bridges, the Cascadilla gorge bridge, the Fall Creek bridge, convenient, it’d take me less than five minutes to get to either one of those breathtaking views once the meeting was over. Taken from the pedestrian bridge looking down into Fall Creek gorge. We, Kay my wife and I spent seven years on a farm in Interlaken New York, 20 minutes outside of Ithaca, New York, home of Cornell University. We made a hand-ladled goat cheese, sold to specialty food shops, supermarkets, restaurants in Manhattan and throughout the Atlantic and mid-Atlantic. Great experience, stressful, sold lots of cheese, acquired a great reputation with cheese mavens and foodies. Profit margin, invisible. Challenging life events during that time: my daughter committed suicide, a close friend, an cinematographer, was murdered while filming in Puerto Rico, a good friend’s son, bipolar, committed suicide, Kay’s mother and father passed on. Both of us were on antidepressants, me for a debilitating fatigue precipitated by Lyme disease, Kay’s depression most likely from a bad string of DNA. The inevitable straw that broke our back: in the middle of finishing an addition to the creamery we lost our milk supply, went belly up, down the drain, bankrupt. In no time we ran out of money. Had to beg for cash from family, scrounge money from friends, could not find work, felt isolated, in fact were isolated, depression no meds could fix, humiliated, angry, furious; if I could keep it up for furious, furious is what kept me going. I was looking for a fight, needed someone to beat the crap out of me. Kay and I, we both went into a tailspin. I never gave suicide a deadline till that morning. Cornell campus is plush with elegant mature plantings embellished and tended too by skilled, schooled landscapers; then to top off the scenery greenery they have two infamous wondrous gorges; the Cascadilla gorge and Fall Creek gorge, framing the campus to the north and south, formed over 2 million years ago by the endless, relentless fury of water and ice racing, pushing downward, carving, cracking, grinding, rocks, pebbles, sand, again and again, over 100 ft deep in places, creating spectacular haunting towering cathedrals, offering plants cracks in its wall to take root in, luring cliff swallows to nest in its crevices and mesmerizing folks, students, faculty, any one standing on one of the bridges looking over the edge facing down into its awesome beautiful terrifying abyss, beckoning. The vista so powerful you can feel engulfed by it, absorbed. The campus has suffered six student suicides in the 2009-2010 academic year, three of them from jumps off the Thurston Avenue bridge. Two tragedies were back-to-back, one on a Thursday, one Friday. According to CNN, the university worked to become a model of suicide prevention after gaining a nickname, legitimately or not, “Suicide University,” in the 1990s. The university’s mental health initiatives director, Timothy Marchel, told CNN that he did not know what may have prompted the recent wave of suicides was unclear, as Cornell had no suicides from 2005 to 2008. CNN reported that the school has consistently fallen within or below the national average, according to Karen Carr, the assistant dean of students at Cornell. Cornell spent brainpower brain-picking, from the 1940’s to this current decade, masticating on the profile of a jumper and his or her predictability, as did psychiatrist and social-orientated professionals. Administrators hemmed and they hawed: what measures should they take to curb a jumper from jumping? When fences were first suggested Cornell balked. Why bother? If someone intent on committed suicide by jumping off a bridge is discouraged by a fence they’ll eventually find some other way to off themselves. Not true, as evidence will bare-out. Another consideration for nixing fences: Cornell, part of the student body and citizens of Ithaca were concerned with bridge esthetics: a fence will mess up the view. True but what holds more value, is more precious, a life or the venerable view. Don’t ask that question to a parent who lost a daughter or son to the gorgeous gorges. My daughter was a plotter, her suicide premeditative. She wrote letters, gave her things away, carefully picked the hour and the means. My suicide, one of passion. I gave it a go as I headed out the door, no goodbye note. There are those who display the classic symptoms of so-called suicidal behavior, who build up to their act over time or who choose methods that require careful planning. And then there are those whose act appears born of an immediate crisis, with little or no forethought involved. Just as with homicide, those in the “passion” category of suicide are much more likely to turn to whatever means are immediately available, those that are easy and quick. Excerpted from: The Urge To End it all. Left the meeting, got into my car, drove off. I got the job; that would take care off us for 5 months. As I turned onto route 89, the scenic route along Cayuga Lake toward Interlaken, to the farm, it hit me; an adrenalin jolt to my gut, my being, my pact, my commitment, the deal to jump. If I didn’t get the work, instead of holding this steering wheel heading home, at this very instant I’d be cascading down into the gorge heading to my certain death. In one blinding flash I stop breathing, no longer was at the wheel. I jumped, dropped, fell through the car seat to the bottom of the gorge, then off to the great beyond and back again, my hands once more on the wheel. Stunned, wiped, zombie-like, running on empty, scared shitless. “I came close to killing myself.” Driving back to the farm I was sure I would have jumped, gave myself no choice, signed on the dotted line, written in stone, a deal is a deal, loose face if I didn’t hold-up my end of the bargain. I could not face the future without a future. Fortunately the coin turned up heads, don’t have to put my commitment to the test, a reprieve. I’m driving back facing Kay, 2 German Sheppards, Sweet Pea and Winter, 5 cats, Brewster, Little Bear, Squirrel, Minky, Edwena, our goat Albert and Stinky the Bankruptcy. When ever I think of life on the farm when I was on the verge of committing suicide, when it could have gone the other way, I find myself trying to talk my self out of the jump. Note: bridge of my own choosing. What drives Cornell Alumni, Jakub J. Janecka, 33 years old, to return to Ithaca ten years later after graduation and take a dive into the Cascadilla Gorge? Witnesses described his jump as headfirst. What does a headfirst dive tell us: determination: nothing will interfere: allows no change of heart: quick and unfailing. How long ago did Jakub J. Janecka entertain self-immolation; a passing thought as he walked over a bridge when a Cornell student, then rekindled years later by one bad month or by years of depression? Sudden impulse? Gradual realization? Jakub J. Janecka received a Bachelor of Science in biology from Cornell University and a master’s degree in theology from the University of Scranton. The past spring, before he jumped, he earned a master’s degree in biology from Catholic University of America. What an awesome combo — biology and theology. He had to be quite a bright unique person given this marriage of two apparently opposing views of the world. No doubt he had much to offer. I would have looked forward to meeting him. There must be others who enjoyed his company; yet no sign of contacts or friends on the social net work except a facebook friend, Jane Goldschmidt, most likely a classmate of his at Catholic University of America. Deciphering God’s DNA, a rare specialty for a student to pursue. Jakub J. Janecka, born in the Uherske Hradiste, Czech Republic, went to grade and high school in Lake Ariel, PA. With Jakub we have the makings of a passionate, exciting, brilliant, fascinating soul. What the fu__ went wrong. How could anyone taking-on the miracles of life and the miracles of God want to off himself? Let’s find out how, think it through, write a film script or novel based on Jakub’s life, a dramatization patching together what is known of him, which is scant, and fill in the unknowns guided by creative instinct, sensitivity, psyche, pathos and passion; find the conflict, the relationships, see where it takes you. Follow Jakub from cradle to bridge. If you’re a filmmaker, writer, novelist, its yours to take on. Jakub J. Janecka return to Ithaca to seek his destiny, to find a bridge, his bridge, the bridge with his name on it, the bridge he envisioned when he decided to commit suicide, envisioned as he drove from somewhere to Ithaca, New York. He must have known that a jump from a Cornell bridge would make news, get him attention. Is that what he sought? As it was he received minimal attention. Several one-day announcements in the local papers. Three responses to Jakub J. Janecka death. 1, A mention in the blog “Cornel Watch”: The Strange Case of Jakub Jan Janecka: The name of the body found yesterday in Cascadilla Gorge has been released, and the details may shock you. His name is Jakub J. Janecka of Lake Ariel, PA, and he graduated in 1998. Why Cornell alum would such make an eerie pilgrimage to Ithaca to commit suicide is as strange a question as it is tragic. 3. Eight years after his death I ask: what about his close friends, his family. He has a brother and sister both with the title of doctor; did they know what he was going through? What was it that turned Jakub against Jakub? Was his pain so quiet, so hidden from his family, friends that none of them saw it? Did anyone look at his face to read, “ I’m not okay! Help!” Did he seek help? Was he a loner, terribly shy? What went bad for Jakub? Was it a sudden alteration in sugar levels, hormones, neurotransmitters? I imagined myself with Jakub, grabbing his shirt collar, trying to drag him back off the bridge. He had to be spent, blinded, tortured by pain, depression, despair when he took that bullet dive. If there were fences installed on the bridges at the time Jakub returned to Cornell he might still be with us, he might have survived long enough to get help. I will miss Jakub J. Janecka based only on the compelling fragments of what I know of him; but that’s enough. Sylvia Plath & The British coal-gas story. Written by the British poet Sylvia Plath, 6 months before she sealed the windows and doors to her kitchen, turned on the gas and knelt in front of her stove. If she had natural gas, instead of coal gas would the outcome differ; before she could find a convenient, easy, sure-fired means of suicide her doctor could have her placed in a psychiatric hospital as he was trying to do before she committed suicide. He was in the process of finding her a bed in an over-filled psychiatric hospital — any day now, a bed for her. Natural gas could have bought him and Sylvia more time? What would happen after a hospital stay and therapy? Don’t know, more poems and extra years she would have never had with goal gas; still eventually suicide, some would say inevitable. Don’t make it easy for the jumper. Create an obstacle. Buy them cool-off time. Read the entire NY. Times piece, “The Urge To End it All” by Scott Anderson. You’ll find research shows that most of the would-be impulsive jumpers — those who are quick to suicide, those who often don’t have time for goodbyes or suicide notes — once the attempt is thwarted they loose interest; they won’t attempt to fulfill the act again. Following is Scott Anderson’s interview of Richard Seiden, a professor emeritus and clinical psychologist at the University of California at Berkeley School of Public Health, best known for his pioneering work on the study of suicide. Much of that work has focused on the bridge that lies just across San Francisco Bay from campus, the Golden Gate. 1990-2008: 21 deaths from jumpers, 15 were from Cornell. 2012: The University is now working with the City of Ithaca to install nets under six of the seven bridges on or near campus. 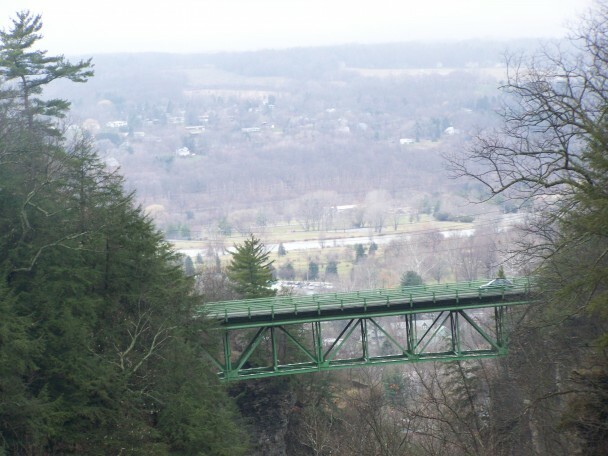 The seventh, the Suspension Bridge over Fall Creek Gorge, will be enclosed by protective netting. What do you think? Howard Ginsberg got a case? Ginsberg has got to be asking himself where is “my responsibility in my tragedy.” “What signs might I have missed?” “Could I have intervened if I paid more attention?” Once loosing a child, life is forever soiled, scarred, diminished, unacceptable, cruel, bitter. Should Cornell bare all the blame? Can the courts divide blame? It took many years and a prominent body count before Cornell finally went the whole nine yards and installed proper suicide deterrents on the bridges. But there was a learning curve for all of the Universities when it came to student suicides; no one got it right the first time around or the second. How should that effect the courts decision if not at all? It’s easier to see Cornell’s culpability, not for public consumption Howard Ginsberg’s. An artist’s rendering of vertical steel-mesh nets draped over the Suspension Bridge. Chain-link fences on Thurston Avenue Bridge. Since the installation of the fences, they have been both decorated and vandalized by students.